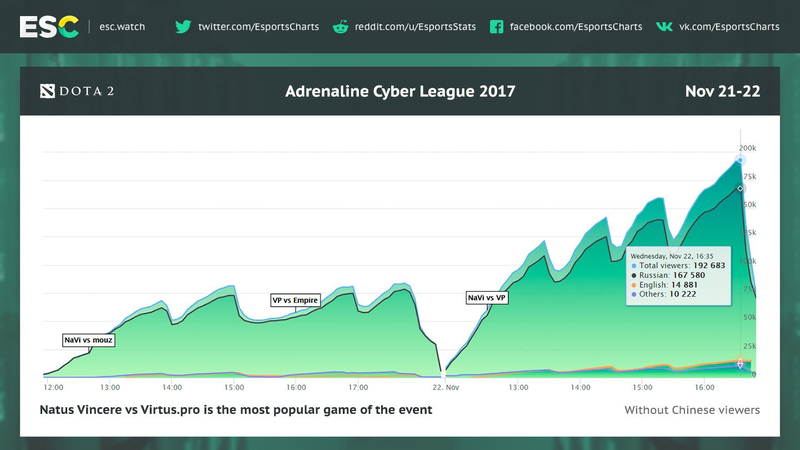 The Russian livestream of the Adrenaline Cyber League 2017 had the largest peak viewership in the 2017/18 season. 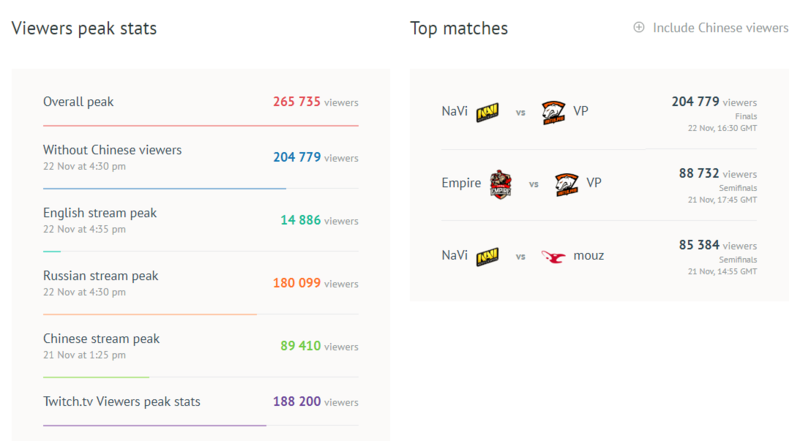 The final match between Virtus.pro G2A and Natus Vincere G2A was watched by up to 167.6 thousand concurrent viewers. The count includes statistics from channels on Twitch, YouTube, and VK. Total viewership, including the English and Chinese streams, reached 253.9 thousand. Notably, the first day of the tournament garnered more views in China than the second. ESL One Hamburg 2017 holds the second place in Russian stream viewership statistics. The final, between Virtus.pro and Team Secret, was watched by up to 143.3 thousand viewers. It is followed by SL i-League Invitational Season 3, whose decisive Group B match between NaVi and Secret peaked at 113.7 thousand viewers. Adrenaline Cyber League 2017 was held in Moscow on November 21–22. NaVi bested VP 3-1 in the final, earning $65,000.